Sir Elton John, wearing pink glasses, was also pictured inside St George’s Chapel. George and Amal Clooney were spotted among the 600 guests for Harry and Meghan’s big day at Windsor. Barrister Amal was all smiles as she walked in, wearing a long, bright yellow dress with matching hat, arm-in-arm with her Hollywood star husband. Singer turned fashion designer Victoria Beckham, who did not have quite the same megawatt smile as Amal, was dressed in a navy outfit and wore coral heels as she walked in with husband David. 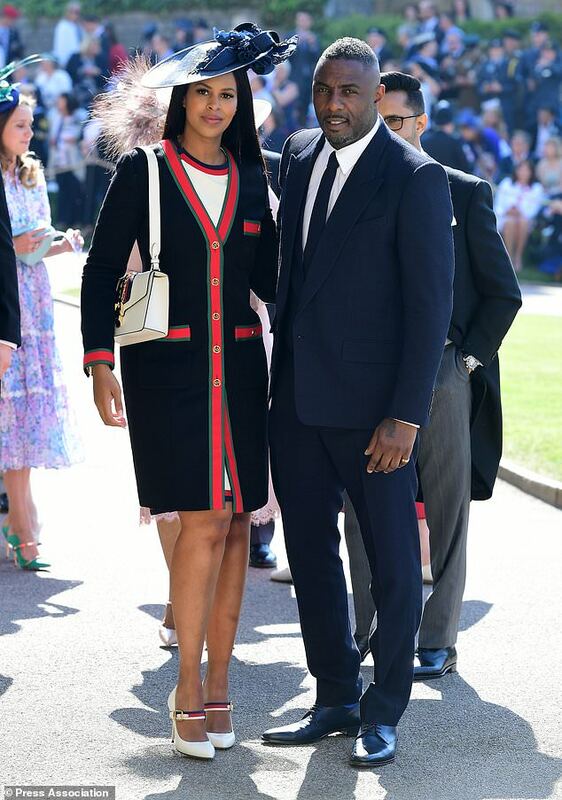 Hollywood star Elba, accompanied by his fiancee Sabrina Dhowre, beamed as he made his way in, under bright sunshine, into the ceremony. 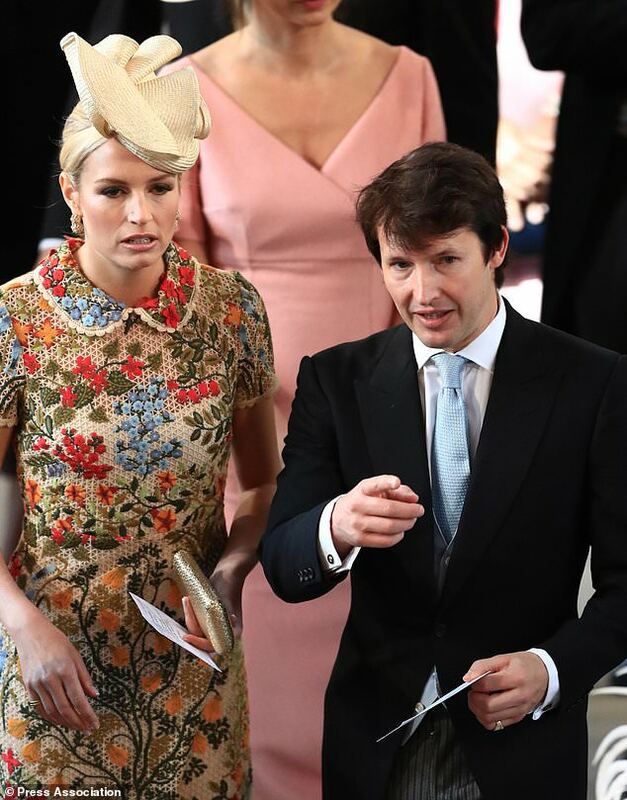 Singer James Blunt and wife Sofia Wellesley were also among the earliest guests for the big day. 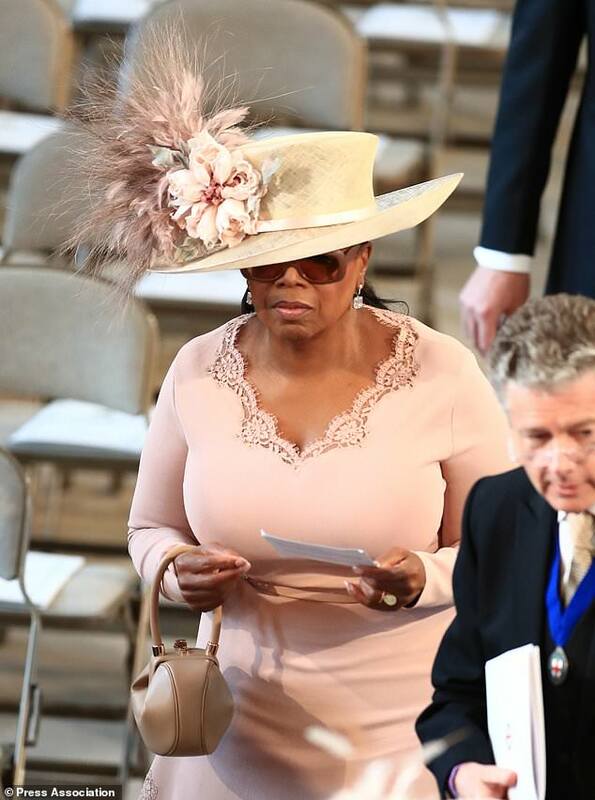 US media magnate and talk show host Oprah Winfrey, who wore a pink dress and wide-brimmed hat, walked in just behind Elba. TV historian Dan Snow was also at the wedding. And actress Carey Mulligan and husband, Mumford & Sons star Marcus Mumford, were also there, as well as singer Joss Stone. Earlier on Saturday morning, Serena Williams hinted that she will be a guest at the royal nuptials – posting a picture of herself in a towel “getting ready for my friend’s wedding”. The tennis star showed fans an image of herself wearing just a white towel on Instagram. Meghan’s Suits co-star Patrick J Adams is in the UK and said that he was already getting emotional even before watching his friend “take this monumental step”. He tweeted: “70 years ago my grandparents, Patricia and Cedric Marsh were married in a small service in Windsor, England. Just found that out. Already getting misty… #royalwedding”. The actor, who played Meghan’s on-screen husband Mike Ross in the drama, previously posted a picture of Suits cast members seated around a table at a restaurant near to Windsor, where the bride-to-be will marry Prince Harry. And he later wrote: “Going to bed now and thinking a lot about the strange surreal and wonderful day my friend Meghan is going to have tomorrow. He and his wife, Pretty Little Liars actress Troian Bellisario, were pictured at the Royal Standard of England pub in Beaconsfield, Buckinghamshire, in a post on Instagram. Two more Suits stars, Gabriel Macht, who plays Harvey Specter, and his wife Jacinda Barrett, who plays Zoey Lawford, have also been in the UK this week. And Sarah Rafferty, who plays Donna Paulsen in the series, appeared on American TV programme Today live from Windsor to talk about attending. She was joined on the programme by Rick Hoffman, who plays Louis Litt in the TV show, and Gina Torres, who plays Jessica Pearson. They told the Today hosts they were delighted to be able to attend the wedding of their friend and former colleague. Other former co-stars and friends of Meghan, including Abigail Spencer and Wendell Pierce, are rumoured to have been invited. Indian actress and philanthropist Priyanka Chopra, a close friend of the bride-to-be, previously said she would be attending. Possible guests also include Ed Sheeran and Ellie Goulding, model Cara Delevingne and former Made In Chelsea star Millie Mackintosh.